IPexpert is thrilled to introduce the first installment in our NEW Protocol Operation and Troubleshooting Series, IPexpert’s IPv4/IPv6 Multicast Operation and Troubleshooting. This series was designed around CCIE student feedback on specific protocols and technologies that they feel they struggled with most when preparing for the CCIE Lab exam. IPexpert’s IPv4/IPv6 Multicast Operation and Troubleshooting dives deep into the specific operations and troubleshooting technologies for key multicast areas such as IGMP, PIM Sparse Mode, multicast security and much more. Developed by the industry’s most recognized Senior Technical Instructors, Editors, and Consultants, this new book series is sure to assist you in better understanding IPv4/IPv6 Multicast operations, troubleshooting methodologies, and time saving fault isolation techniques. Well here we are again. Feels kind of weird starting all over. 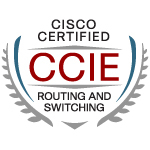 I decided to move ahead and pursue the Security CCIE. I was thinking of going after the Service Provider CCIE, but the security track aligns much more with my experience outside of R&S. I am going to start prepping for the written in the next few days. For the written I am going to use INE’s ATC class. For my lab prep I purchased IPexpert’s BLS, and have INE’s workbooks as well.